I’ve posted a full Flickr set of the unboxing of the iMac and iPod – not too many pics as it’s been done already. It’s too early to feel settled with OS X although I’ve so far managed to do everything I’ve wanted to, including an almighty struggle to get my iTunes library over to the mac from the pc. I ended up hacking the library xml file to get it to work. However the iMac hardware is stunning. Quiet, fast and bright – in fact too bright much like when you view a TV in a store and it’s set to 100%. I ended up reducing the brightness to just over half to make it easy on the eyes. Even then it was brighter than my last LCD. Still can’t get used to using the Apple key for cut, copy, paste and there are obviously lots of oddities that will take time to understand. Expose is stunning though and makes managing multiple windows a painless task – windows could learn a lot and that still hasn’t been addressed in Vista which is an issue as more people move to larger and larger desktops. The iPod is as impressive as ever. Screen is bright, video’s look sharp although I still think it’s too small to watch TV episodes and movies on. Most noticeable are the new earbuds – comfy and sound good. Gapless playback is also welcome…at last. Downsides. Only one at the moment – the Mighty Mouse. It is OK but not a patch on my old Logitech which will be pressed back into service. The virtual right mouse button is awkward and the side buttons require a lot of pressure to activate. Not for me and it defies logic as to why Apple couldn’t design something better. Seeing as I’ve spent only a day with the iMac I’m surprised how easy it is to perform basic tasks although I do feel vulnerable due to my lack of knowledge. If something went wrong I would probably struggle badly. With Windows I felt comfortable that no matter what I did I could rectify the situation – it will take a while to get that feeling with the Mac. Hardware has also worked like a dream, both new and old. Joy of joys – I don’t have any dead pixels (well none that are obvious and although I’ve scanned a few times and can’t see any I ain’t going hunting). Thoroughly delighted that I finally made the move. It will be interesting to see how the next few weeks go as I scratch beneath the surface. To be honest I can’t wait. The Ryder Cup has made for some great viewing over the past three days. I couldn’t believe the amount of putts that the Europeans sank, especially today – the Americans had no answer. Clarke’s emotion on winning and the respect that his fellow golfers had for him was good to see although I think the BBC saying that ‘Sweden’s Henrik Stenson robbed Darren Clarke of a fairytale ending’ was a bit strong. Highlights were Casey’s hole in one and Clarke’s chip in on the 16th yesterday. High fives to Sky also – their HD coverage of the tournament was superb. Overall a tremendous tournament made better by us winning…and in some style too. In around a weeks time I’ll hopefully taken receipt of my iMac. Really looking forward to it and I’m also thankful that I’ve kept some money aside for a few apps that I really want. 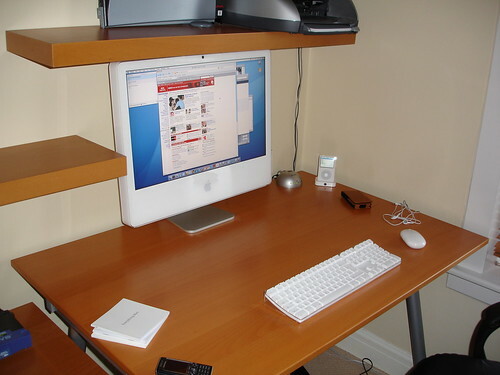 Some are mentioned on Grahams list and other can be found on this ultimate Mac software list. One in particular is Delicious Library. I’ve dabbled with pc based media libraries but none look to be as well crafted as this. Yep – I’m becoming a Mac bore. I’ve not mentioned 360 games for a while and there’s one that has come out recently that has been a major surprise – Test Drive Unlimited. I’ve never been a big fan of the Test Drive series….too arcadey, not enough challenge – just never sat well next to other racing games. The first demo released over Live didn’t promise too much either – ok graphics and pretty average handling. Demo 2 however was a big improvement but I still wasn’t sure. I’ve now been playing this for the last week and it’s just great. Basically the game lets you do what you want on the island of Hawaii. There is around 1000 miles of road to explore and race on. The single player challenges allow you to earn money, buy houses and cars and test yourself against AI racers through a variety of challenges. Most of these have been excellent so far especially as the challenges involve weaving through and avoiding police – think a deeper Burnout and your almost there. However as you drive around the island you are permanently online with players from around the world and on your friends list racing alongside. You can challenge anyone at any time or be challenged yourself, take part in events set up by other users or join a car club and race fellow members or other clubs online. The best part of this is that the races are fairly random. In challenge mode you can race from your current position, through traffic to any part of the island. The GPS guides you and it can get frantic with two or more weaving through traffic watching the map at the same time. The car choices are pretty wide ranging and although the game offers tune ups they are fairly limited with most opting for the highest tune up setting available. Handling can still feel a bit iffy on some cars and I think the motorbikes are a waste of time but there are a massive amount of cars that are worth owning and racing. There is also some graphical pop up but not enough to make you stop playing and to be honest the graphics are good so it’s a minor gripe really. The game really is a joy to play and has delivered one of my gaming wishes – a free terrain to race anywhere on with friends online. Due to the freedom allowed there is also no chance of ever learning ‘a track’ as you decide the start and finish points and if you can’t be bothered with picking a end point there are a couple of purpose built race tracks tucked away on the island. Surprisingly this is a must have title for the 360 – buy it.